As a branch of Laser Cutting Shapes, we are using the best laser systems to cut the most intricate details for fashion, interior design, medical and military industries. Our textile cutting systems are fast and most precise CO2 laser cutting equipment on the field. We have several such systems that are used to manufacture variety of products. 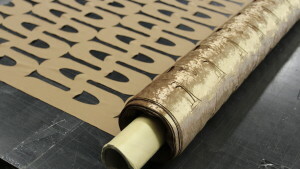 Laser cutting fabric and other textiles is, in most cases, is very beneficial. Read more: Why Lasers explains the benefits. Laser cutting fabric and other textiles is in most cases is very beneficial. 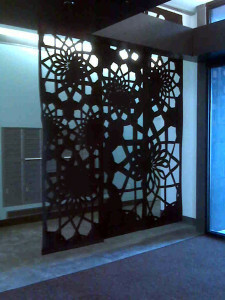 Size: Laser Cut Felt Divider for an architect firm. 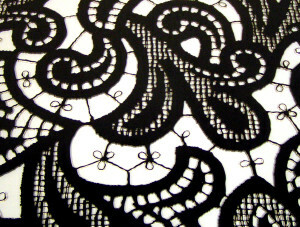 Intricacy: Laser cut lingerie pattern. 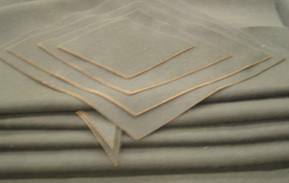 while cutting due to the high temperature reducing or completely eliminating fraying. As a result sewing of the edges is not required in most cases. Our equipment takes rolls of material up to 60 inches wide (effective cutting width 51 inches) and we can cut in another direction endlessly. is minimal due to the efficient layouts. Laser cut lines could be close or almost next to each other. Laser cutting fabric and other textiles is in most cases is very beneficial. there is no competition to digital laser cutting. We can provide the most intricate laser cuts and designs you can imagine. Our process allows laser engraving of fabrics. There are cases when designers want to have logos or process notes to be engraved. We accept designs in vector format for laser cutting and bitmap formats for laser engraving. Typical formats are adobe illustrator, pdf, AutoCAD files, etc.